Dancing in the Rain: What's a Vacation? Guess what? I get to pick next week's Listicle topic! Next week, I would love for everyone to write 10 reasons why you do or do not want more children! OR, if you don't have kids, 10 reasons why you don't, including if you ever will. Now I know this could potentially be too personal for some people (then again, we are bloggers), but I implore you to find a way you can comfortably talk about it. You can make it funny, sarcastic, just practical or really heartfelt. Set whatever tone you want. I promise neither Stasha nor myself will let anyone get away with saying anything judgy! We all know the choice to have children is a big deal. OK? Good. Now back to this week! Today's Listicle topic is 10 things that make a perfect vacation chosen by @HStayingAfloat. How should I know? I don't go on vacation in the true sense of the word. A true vacation is when you get to stay in a hotel and be waited on hand and foot. Our vacations always involve visiting family and friends. Which isn't awful by any means. But family and friends rarely pamper you. They're all, you're not a guest here, make yourself at home! Yeah. At home I do chores. Thanks. Soooo, my list will be what I would love to experience on vacation. 1. I would love to take my children to Disney World. That needs no explanation. 4. ...Egypt so we could see the pyramids and fly home from there. 7. ...get massaged, clipped, dipped, waxed, exfoliated and toned. I would eat yummy froo-froo stuff, do yoga, and knit and read at night. I have entered several sweepstakes to win such a trip. 8. Our honeymoon, while only to San Diego, was pretty ideal. We had plenty of money to do and eat whatever we wanted. 9. We ate a meal in La Jolla that is to this day one of the most memorable of my life. Two words: lobster and sunset. We had so much fun together! 10. In short, the perfect vacation would be to somewhere I've never been before (plenty of places to choose from), I would stay in a hotel and just play and relax. Probably what anyone would say. I hope you'll get to go on your dream vacation eventually. And it will be even better...because you got to dream about it for awhile first. Ooh, I love next week's prompt! I might need to do two lists - one for wanting more and one for not. Our vacations are always visiting family, too, so I have the same ideas about a perfect one as you do! I hear you! Great list, so real and hopefully you get to tick it off soon! I love how you said you had a great time on your honeymoon. You would be surprised how many people don't. Great topic choice. Very interesting. I cannot wait to sit down and think up something. I dream of seeing the pyramids too. Hubby is happy going to Galveston, lol! Ah, Egypt. Brings me back to 6th grade history class where I made a diaroma of the pyramids. I hope you can get there sometime soon! I would love to go to Egypt too and see the pyramids. And don't knock San Diego - it's the perfect place for a honeymoon!! I like your topic for next week - I don't think it's too personal, we are all bloggers after all and I wouldn't read anyone's blog that wasn't personal, you know?! Can't wait! Ooh! Great topic for next week!! And your list of vacation wishes is great! I love the spa one...and if you ever win one of those sweepstakes, make sure you let us know!! I really like your blog layout and icons. Fun topic, too! Sounds fantastic! Especially the pampering. And also Disney World. Basically, I'll take numbers 1 through 10, please and thank you. interesting topic for next week... hmm... food for thought! Sounds lovely - especially the spa part! I hope you get to take your kids to Disney World. As a kid we used to drive there every spring break. It's a very magical place. So excited to read the post for next week! This is something I think a lot about - am I done having kids... Yep probably??? :) I only blog once a week, and am not certain I will link up, but I will DEFINITELY have to come back to read the submissions. What an interesting topic! Disneyworld. I need to go there again. The first and last time didn't work out for me (that's another story though)! BUt lobster and sunset, I'll go for that anytime too! Vising from NaBloPoMo. 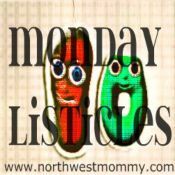 I love this list link up and that children one will be so interesting. Your ideal vacations sound pretty fabulous!